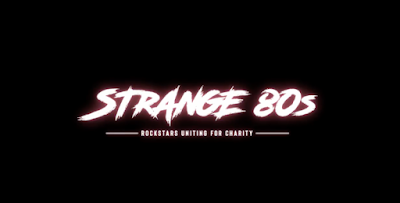 Charity Bomb's Strange 80s 2 took place at the Fonda Theatre and featured performances by a rotating cast of rock stars & celebrities covering the timeless anthems of the 80s. All proceeds from the event will go to 320 Changes Direction, serving those who suffer from mental health, depression and addiction issues. Highlights include David Hasselhoff arriving at the red carpet with KITT of Night Rider fame, Saved By The Bell's own Mr. Belding (Dennis Haskins) performing Def Leppard with Chris Kirkpatrick of *NSYNC, as well as additional performances from Jesse Hughes & Jennie Vee of Eagles of Death Metal, Tom Payne (The Walking Dead), Adrian Young of No Doubt, Derrick Whibley & Frank Zummo of Sum41, Scott Ian & Charlie Benante of Anthrax, Jaret Reddick of Bowling For Soup, Dave Kushner of Velvet Revolver, Dan Konopka of OK Go, Marko Desantis of Sugarcult, Richard Patrick & Johnny Radtke of Filter, John 5 of Rob Zombie, Noodles of The Offspring, Tye Trujillo of Otto, Kristopher Roe of The Ataris, The Regrettes, and many more. Charity Bomb is a non-profit organization founded by four philanthropic friends to produce benefit shows for a variety of charitable organizations in the scope of music. Our motto is "All Purpose Altruism" - we deliver 100% of the proceeds, 100% of the time, with 100% transparency, to ensure that the funds raised reach its intended constituency, every dime, every time. Musician & Philanthropist, Matthew Leone was put into a coma with 1/3 of his skull removed after rescuing a woman being beaten on the streets of Chicago a few years back. From Kevin, Lyman & Warped Tour, to Kiss and Madonna, the international music community rallied to bring him back to life. Smashing Pumpkins even did a benefit show for him. Twin brother, singer for their band Madina Lake, Nathan Leone agrees, this is what saved his life. Consequently, the Leone's devoted their lives to giving back. After several years with Sweet Relief Musicians Fund & Help Musicians UK, it was time to branch out. All-Purpose Altruism - Charity Bomb reflects the ubiquitous truth that love is the antidote for everything. This notion, as applied in our philanthropic context, asserts that we will drum up love, in all of its forms, for a particular cause or purpose, and drop it on the antagonist. Los Angeles native, professional musician & acclaimed songwriter, Nik Frost, suffered from addiction. When drugs came dangerously close to claiming his life, it was fellow musicians, Dave Kushner & Brian O'conner (Velvet Revolver & Eagles of Death Metal respectively) who intervened and came to his rescue. Nik worked with Matthew on several projects, all a pre-destination to Charity Bomb. We are a non-profit, fundraising and awareness agent for any benevolent cause that enters our ether. Ryan Ford, lifelong closest friend, philanthropist, successful entrepreneur, an avid lover of music, is the fourth Charity Bomber. Ryan's founded several businesses, MP45 Records among them, and brings the administrative acumen to complement his creative contribution to the collective. In short, we have the purpose, we know the right people and we know how to put on a show. We love a win-win-win outcome. It's abundantly clear that living a life where we produce spectacular live music events that serve a philanthropic cause, makes our constituents win, our clients win, and the fans win. 320 Changes Direction is the latest strand of GiveAnHour.org's Campaign to Change Direction. It is a coalition of concerned citizens, nonprofit leaders, and leaders from the private sector who have come together to change the culture in America about mental health, mental illness, and wellness.